Celebrate Good Times with Us! Celebrations Entertainment is a full service entertainment company servicing all of Rhode Island, Boston, Newport, Block Island, Cape Cod and the Islands. From DJ/music, videography, photo booths, décor lighting, invitations, officiant and tuxedos, we provide each client with the precise services for their unique event. Whether it’s your wedding day, prom, corporate gathering, birthday or anniversary celebration, Celebrations Entertainment can handle anything and everything regarding your special day. Celebrations Entertainment is a Unique Full Time Entertainment One Stop Shop for Weddings and other Events both Corporate and Private! We promote a “leave the worry to us” philosophy and ask that you relax, greet your guests and enjoy your day! After all, we are the professionals and we do this every week! Our Mission is to provide our clients with Professional, Experienced, High Quality yet Personalized Services at reasonable package prices. Our services can be booked as a package or a la carte. We pride ourselves on understanding the significance that our services have on your event and we always deliver you a truly stress-free day that you will thoroughly enjoy! 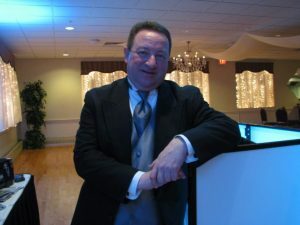 Professional Award Winning DJ/Emcee/Entertainer and Owner Jim Gagnon has been entertaining and performing for weddings, corporate and all types of celebrations for over 35 years. His Mass Communications background in radio, television and entertaining has made him one of the most sought after Disc Jockeys in the New England Area. His fun style, experience, professionalism and energetic personality guarantees that every event you choose Celebrations Entertainment to perform at will be a success. His extensive music knowledge, ability to read the crowd and create just the perfect flow and music mix, will keep your dance floor packed at every event! And the best part is that you get him “Jimmy G” entertaining your crowd at every event, not a substitute, along with an experienced professional disc jockey assistant from the award winning Team Celebrations Staff. Our dedicated trained professional team staff for all of our many services are second to none and are committed to our clients and the success of every wedding and or event! We believe you are engaging our services for one of the most important days in your life and we take that trust you place in us very seriously. Let us create many new exciting memories for you and your guests at your next event!